Air China began direct flights on Thursday connecting Beijing with Nyingchi, a popular tourist destination in southwest China's Tibet Autonomous Region. Tibet Airlines will begin operating two new air routes linking Lhasa with two other domestic cities: Shenzhen and Changsha on Friday, authorities said. The number of visitors to Tibet is expected to hit 17 million in 2015. China has opened another land crossing in the Himalayan mountains, via Nathu La, allowing Indians an easier passage for their Hindu pilgrimage into Tibet. The base camp on the north face of Mount Qomolangma in Tibet Autonomous Region will reopen to climbers on Wednesday, according to local tourism authorities. Lhasa, capital of Tibet Autonomous Region, enjoyed 356 blue-sky days last year, as many Chinese cities continue to be troubled by air pollution. Tourism revenue in Tibet Autonomous Region surged nearly 40 percent during the first four months of this year, thanks to a 22.2-percent increase in visitors to the region during the same period. Tibet has launched an e-commerce project to help the region's companies expand, local authorities said on Friday. Forty-six Tibetans who had been stranded in Nepal by last month's earthquake returned to Lhasa, Tibet Autonomous Region, Monday morning. More relief supplies have been sent to Tibet as efforts continue to help with disaster relief in the region following the 8.1-magnitude earthquake that struck Nepal on Saturday, said the Ministry of Civil Affairs on Tuesday. This winter, more than 100,000 households in Lhasa, capital city of Tibet Autonomous Region, received the government heating subsidies. In 2014, Tibet received 15.53 million tourists and its annual tourism revenue hit 20 billion yuan RMB, increasing 20% and 23% respectively, according to the 3rd session of the 10th TAR People's Congress. The economy of Tibet Autonomous Region, in southwest China, grew 12 percent in 2014, a regional economic work conference was told on Wednesday. China invested a total of 30 billion yuan (4.87 billion U.S. dollars) on water infrastructure projects in the Tibet Autonomous Region in the last two decades, data from the Ministry of Water Resources showed on Saturday. According to the Lhasa Tourism Bureau, with the improvement of tourism infrastructures and the development of tourism market, tourism sectors in Lhasa received about 23000 registered tourism groups in 2014 and the number of tourists is about 480000. Farmers and herdsmen in China's Tibet Autonomous Region saw their average income increase 14 percent year-on-year in 2014, marking a straight 12th annual double-digit growth, local authorities said on Sunday. Tibet reported a tourism boom in 2014 as the Chinese plateau region attracted more than 15 million visitors in 2014, up more than 20 percent, according to the local government. Tibet Autonomous Region saw a record 3.15 million air passengers in 2014, up 14 percent from the previous year, according to regional civil aviation authorities on Wednesday. Tibet’s tourist revenue in the first three quarters of 2014 reached 16.382 billion yuan(2.68 billion U.S. dollars),accounting for 24.76 percent of its regional annual GDP in the same period, according to chinatibetnew. For the first time in Lhasa's history, capital city of Tibet and one of the highest cities in the world, nearly all of its urban residents have access to gas heating this winter, local authorities said on Monday. The Tibet Autonomous Region now has a new city after Xigaze was upgraded and inaugurated to become the third prefecture-level city in the region on Thursday. China's glaciers have retreated by about 7,600 square km, an 18 percent retreat since the 1950s, Chinese scientists have found. Work began on the rail line from Chengdu, capital of southwest Sichuan Province to Ya'an, a city in the province on Saturday. The 42-km Chengdu-Ya'an section is an important part of the Sichuan-Tibet railway. During the period of 12th Five-Year Plan , the construction of Tibet's rural highway is carried out rapidly. A construction fund of 20.43 billion yuan RMB has been implemented, increasing 498% year on year. It is predicted that Tibet's rural highway mileage will break through 60000 kilometers by the end of the 12th Five-Year Plan period. For the past three decades, Tibet has received 1679 foreign mountaineering teams and 17248 people since 1980. Tibet Autonomous Region has finished this year's afforestation project with increased forest coverage of 82,666 hectares, up by 23 percent from last year. The scent of burning juniper branches filled the morning air in Lhasa on Thursday as the annual Lhabab Duechen – Buddha Descending Festival - began. At present, Qamdo Bamda Airport is carrying out the experimental project of the construction of its second runway and preparing for the expansion work. Tibet Autonomous Region announced Thursday it has relaxed its family planning policy to allow couples to have a second child if either parent is an only child. Affected by winter snowfall, the Medog hiking route is officially closed by Tourist Administration of Medong County and Mainling County recently. According to administrative office of the Potala Palace, the ticket price will decline from 200 yuan RMB per people in peak season to 100 yuan RMB per people in off-season since Nov. 1. Then Potala Palace's official website will stop selling electronic booking tickets. Recently, "national ecological culture village" experience exchange meeting was held by China eco-culture association in China' s Qingdao. 109 administrative villages are awarded "national ecological culture village". 4 of them belong to Chamdo Prefecture of Tibet. Nepali Vice President Parmanand Jha hopes that a new Tibetan railway can one day extend to Nepal and boost bilateral trade and tourism. This year, Lhoka Prefecture held a series of tourism festivals and various tourism promotion activities, which makes the region's tourism revenue rise by 33% year on year in the first eight months. Hard seat tickets for the newly-opened Lhasa-Xigaze railway service are as precious as oxygen, as an unexpectedly huge number of travelers opt for to the new means of transportation. According to press conference held by the People' s Government of Tibet Autonomous Region on Sept. 10, 2014, China Tibet Tourism and Culture Expo will kick off from Sept. 25 to 27 in Lhasa. Total import and export value of small-scale border trade reached 5.679 billion yuan RMB, up 32.69% from the same period of last year. A chamber of tourism was established in Lhasa of Tibet Autonomous Region on Sunday to help enhance the region's tourism industry. Initiated by 30 private tourism companies, the association is expected to be a platform for local tourism companies to finance, cooperate and promote tourism services, as well as safeguard their rights, according to Nyima Tashi, head of the chamber. According to a press conference held in Lhasa, the 11th Tibet Sports Meeting will kick off from August 29 to Sept. 5 in Tsethang Town of Lhoka Prefecture. According to Tibet Sports Bureau, Tibetan athletes won two golden medals, five silver medals, eight bronze medals at the first National Martial Art Sports Meeting held in Tianjin. This year's Dama Cultural Tourism Festival will be held in Gyangze County from Aug. 15 to Aug. 20. The festival aims to develop and show Gyangze's historical and cultural tourism value and achievement, and tourism charm. 2014 Changtang Horse-racing Cultural & Commercial Tourism Festival kicks off on August 10th and lasts for 4 days in Nagqu, according to the press conference of T.A.R. Government. Tibet's total highway mileage will reach 110, 000 kilometers by 2020, of which 65% is national third-class highway and above. Ngari Prefecture in southwest China's Tibet Autonomous Region plans to have a 2,500-square-km plateau formally recognized for its unobstructed view of the night sky. Rural tourism now still plays an important role in the booming tourism in Tibet, it will provide more opportunities to increse incomes for local farmers and herdsmen. Lhasa government has funded 77.8 million yuan to repair dorms for 168 temples, to further improve their infrastructure constructions. According to Lhasa business department of Sichuan Airlines, Sichuan Airlines will open Lhasa-Lijiang-Kunming new round-trip route from July 1. According to Sport Bureau of Tibet Autonomous Region, Tibet will hold the first session of mountain bicycle race in October. The race, with an altitude between 4300 and 5800 meters, is considered to be China's highest altitude bicycle race. It will kick off in Damxung County of Tibet. The 8th Yellow Peony and Tibetan Medicine Cultural Tourism Festival opens in Mainling County in Nyingchi Prefecture of Tibet Autonomous Region on May 28, 2014, which will last until May 30. China's Qinghai-Tibet Plateau, the major source of the country's largest rivers, has seen its glaciers shrink rapidly over the past 30 years, a national research institute revealed yesterday. 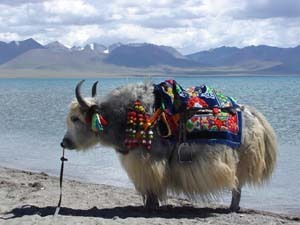 In the past traveling to Tibet might be a remote dream. The poor accessibility and appalling high altitude made many people hesitate to step on this mysterious and enchanting land. Today tourists can not only choose to take flights or cars into and out of Tibet, but a new means - train available. Tibet Train Travel is your best personal travel guide to Tibet! According to China Railway Corporation, Lhasa-Shigatse Railway opens on August 15, 2014. The first passenger train starts from Lhasa at 9:00 am on August 16. The overall length of Lhasa-Shigatse Railway is 251 kilometers. It lies in the Tibet Autonomous Region, southwest part of Qinghai-Tibet Plateau. There are 14 railway stations along the whole line, covering Lhasa, Chushur County, Shigatse and so on. Maximum operation speed is 120 kilometers per hour. Volume of rail freight reaches over 8.3 million tons per year. As the first extension line of Qinghai-Tibet Railway, Lhasa-Shigatse Railway plays a vitally important role in setting up Tibet railway network. The opening of Lhasa-Shigatse Railway will undoubtedly improve Tibet's transportation conditions. Visiting Lhasa by train has become a popular choice. The Qinghai-Tibet Railway, known as the sky line, has been functioning for 7 seven years since July 1, 2006, when it was officially put into operation. The railway has not only benefited the local economy, but also protected the environment by virtue of the revenues it has yielded. The railway traverses three national-level nature reserves, namely the Hoh Xil, Sanjiangyuan and Changtang reserves.Environmental supervision of the railway started before its construction and continued after its first operation on July 1, 2006. On October 17th, 2012, the Ministry of Environmental Protection reviewed the world's highest rail system and announced the results to be "satisfying" after evaluation, according to the People's Daily. According to the ministry, the wildlife paths, protection of vegetation, frozen earth, marsh and scenery, as well as anti-pollution measures have met expectations, and realized the harmony between the projects and the environment. Government data indicates that the region received 10.58 million tourists in 2012, a sharp surge compared with 1.8 million in 2006, according to Xinhua reports. Spanning 1,956 km including nearly 1,000 km at an altitude of over 4,000 meters, the Qinghai-Tibet Railway is the world's highest and longest railway on plateau. The railway line has brought huge economic benefits to both Qinghai and Tibet. In 2011, the railway line saw a record high of tourist number of 10 mln, in and out of the region, compared with 1.8mln in 2006, 2.7mln in 2007 and 6mln in 2010, according to Wang Songping, deputy chief of the regional tourism bureau. Starting from scratch after the Peaceful Liberation of Tibet in 1959, Tibet's tourist industry began to sprout right after the reform and opening up policy issued in 1978 by Deng Xiaoping, the architect of this policy. In 1980, Tibet's first government- run travel agency, China International Travel Service, was founded, according to Wang Songping, the current deputy director of the regional tourism bureau, whose first job was a tour guide in Lhasa in 1984. Wang said that Tibet's tourism is much more vibrant compared with the previous years, in terms of government support from all levels, in all aspects and the diligence of the local government and common people. "Over 100 hotels opened in Lhasa in 2007, one year after the operation of the Qinghai-Tibet Railway", according to two editors from the local tourism magazines. China will soon finish building an extension line of the Qinghai-Tibet Railway to link Lhasa to Xigaze, the second largest city in southwestern Tibet Autonomous Region, chairman of the Tibet regional government Losang Jamcan said Friday. "Hopefully, the Lhasa-Xigaze rail line will be completed at the end of this year or the beginning of 2014," Losang Jamcan said in a group discussion of the government work report at the parliament's annual session, which opened in Beijing Tuesday. He said the completion of the project would facilitate the development of an ecological tourism zone that covers Lhasa, Xigaze and Nyingchi cities. China began the construction of the 253-km line from Tibet's capital Lhasa to Xigaze in September 2010. Stretching through five counties as well as over the 90-km long Yarlung Zangbo Grand Canyon, the line is expected to bring rail line for the first time to the southwestern parts of Tibet, which now rely solely on roads for transport. This is the first extension of the Qinghai-Tibet Railway that opened in July 2006. The Lhasa-Xigaze railway, with a budget of 13.3 billion yuan (about 2.1 billion U.S. dollars), is capable of transporting 8.3 million tonnes of cargo every year, according to previous reports. In building the new line, engineers have designed route detour around nature reserves and drinking water sources to better protect the fragile plateau environment. Losang Jamcan said Tibet will continue to boost infrastructure construction to bring out the potential for tourism while protect the ecological environment in the region. Tibet received 11 million domestic and overseas visitors last year, bringing in a total tourism revenue of 13.2 billion yuan (2.1 billion U.S. dollars), data from the regional government showed. Xigaze, with a history of more than 600 years, is Tibet's second largest city and the traditional seat of the Panchen Lama. Xigaze City is the administrative center of the Tibetan prefecture of the same name, a 182,000 square km area that borders India, Nepal and Bhutan. It is also famous for Qomolangma (known as Mount Everest in the West), which rises up from within it. According to Qinghai-Tibet Railway Company (QTR Company), the number of passengers in 2012 reached 10.76 million, increased by 160,000 compared to the data in 2011. In the meantime, 56.06 million tons of goods are transported by QTR, a year-on-year increase of 4.42 million. Since the operation of Qinghai-Tibet Railway in July 2006, the accumulated number of passengers has reached 58.62 million, and the accumulated cargo weight has attained to 274 million tons. It is planed that by the year of 2015 the operating mileage of QTR will reach 5,616 kilometers, and the annual volume of passengers will break though 14 million person. The 1956-kilometer-long QTR starts from Xining, capital of Qinghai Province to Lhasa, capital of the Tibet Autonomous Region. As the highest and longest railway in the whole world, it is renowned as the "sky road". The world's longest plateau railroad,China's Qinghai-Tibet Railway, has achieved zero garbage emissions since its start of operation on July 1, 2006. "More than 180,000 tonnes of garbage was generated by its passengers in four years but all of it was classified and treated properly," said Li Li, a senior official with the Qinghai-Tibet Railway Corporation. "T hree garbage disposal stations are located along the railway, namely in Xining City and Golmud City, both in northwest China's Qinghai Province and Tibet' s capital Lhasa. There are a total of 21 vacuum sewage suction trucks at the three stations that collect the garbage and sewage generated on the trains day and night," Li added. Gao Zhantao from the Golmud garbage disposal station said, "We send the garbage and sewage to local parks to be utilised as fertilizer for flowers and trees." Li said the railway company has been doing this to protect the plateau environment along the railroad. The Qinghai-Tibet Railway stretches 1,956 kilometers from Qinghai's provincial capital of Xining to Lhasa. The section of 814 km from Xining to Golmud began operation in 1984 and the construction on the Golmud-Lhasa section started on June 29, 2001. More than 95 percent of the Qinghai-Tibet Railway has been in good condition since it opened to traffic in July, 2006, according to China National Radio. Furthermore, 98 percent of the 1,142-km section between Golmud in Qinghai Province and Tibet's capital of Lhasa has been in stable condition. 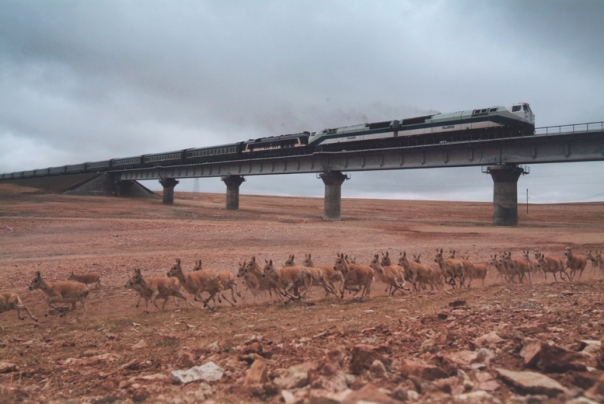 The Qinghai-Tibet Railway, the highest in the whole world, traverses the places with the harshest conditions. To protect the environment along the railway, electrical energy, solar energy and other clean energies have been used widely. All the wastewater and garbage on the trains are disposed of in designated sites so as to meet the zero-pollutant discharge target along the railway. Meanwhile, education in environmental protection has been carried out for the railway maintainers, who have been instructed not to disturb the migration of wild animals in their worktime. No serious environment-damaging cases have ever been reported in the past three years. Moreover, the operation of the railway has contributed a great deal to the development of Qinghai and Tibet. The railway transported 5.41 million passengers and 28.84 million tons of cargo in 2009. A Qinghai-Tibet Plateau expert said on Tuesday that the Qinghai-Tibet Railway will not be affected by global warming in at least four decades. Yao Tandong, a researcher with the Qinghai-Tibet Plateau Research Institute of the Chinese Academy of Sciences, told Xinhua the highest railway in the world was built with designs to accommodate the impact of global warming. The railway runs 1,956 km across the frozen tundra of the Qinghai-Tibet Plateau from Lhasa, capital of the Tibet Autonomous Region, to Xining, capital of the neighboring Qinghai Province. About 960 kilometers of the track is 4,000 meters above sea level, with the highest point at 5,072 meters. "According to the current pace of global warming, the plateau's temperature would rise 2.5 Celsius degree around 2050 from the end of 20th century," Yao said on the sidelines of the annual parliamentary session. He said the railway was built to allow a 2-3 Celsius degree temperature rise through measures including fixing ventilators under the railway and installing equipment producing cooling air to prevent thawing of tundra. The highest and longest plateau railroad of the world goes through a 550-km tundra area, with frost soil less than 400 km including less-than-190 km "unstable tundra" and less-than-100 km high-temperature tundra area, studies show. Tundra was the railway's "footstone" to ensure a stable roadbed, Yao said, adding the railway authority should step up monitoring and early-warning mechanism so as to handle possible geological hazards. The 814-km section from Xining to Golmud, Qinghai, began operations in 1984. Construction on the Golmud-Lhasa section started on June 29, 2001. The project is dubbed an "engineering marvel" because people used to think the perennial ice and slush along the route could never support tracks and trains. It has been the first railway to connect Tibet with the rest of China. The Qinghai-Tibet Plateau, where about 84 percent of the country's glaciers are located, has also seen an annual glacier retreat of 131.4 square kilometers, twice the size of Beijing's downtown area, in the past three decades. Experts say a further 13,000 square kilometers of glaciers will disappear from the plateau by 2050 if no protective measures are taken. Global warming was the main cause of the glacier retreat. Since opening to traffic in July 2006, the Qinghai-Tibet Railway has carried six mln passengers and five mln tons of cargo, setting the record highest speed of 100 km per hour in the permafrost region. The railway is 1,142 kilometers long, wiht 960 kilometers standing over 4,000 meters above sea level, and 550 kilometers running through the permafrost region. It has adopted a variety of advanced technology such as active cooling down measures, thus effectively reducing the damage to the permafrost region, according to Wang Zhengming, head of the No. 1 Railway Survey and Design Institute, which is in charge of the survey and design of the Qinghai-Tibet Railway. With regard to the plateau health care technique, which is considered a hard nut to crack in the world, Qinghai-Tibet Railway managers have instituted a complete health care system for highland construction. The system has brought down the incidence of plateau lung edema and cerebral edema to below 0.59 percent and 0.31 percent, respectively, far below the 15.50 percent and 9.90 percent in other countries. 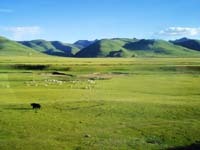 The Qinghai-Tibet Railway has set many national and international records in terms of plateau environmental protection, such as 100 kilometers of passages for wild animals, alpine cold meadow and grassland restoration projects in earth-fetching areas over 4,000 meters above sea level, and treatment of low-temperature waste water from households in the condition of a low oxygen content. Wang said that the success of the Qinghai-Tibet Railway established China's leading position in terms of railway design and construction in the permafrost region. Qinghai-Tibet Railway: environment-friendly "sky-high road"
The Qinghai-Tibet Railway Company has taken various measures to protect the environment along the Gela Section of the Qinghai-Tibet Railway since its operation two years ago. Li Li, a leading official of the company, said that to make restore vegetation along the railway a success, his company planted trees and grass. As a result, a 600-km-long green belt covering 4.5 million square meters has been completed. To prevent air pollution, railway stations along the Gela Section have adopted pollution-free energy for heating, such as electricity and solar energy. For instance, the Lhasa Railway Station uses light diesel oil for fuel, with solar heating as auxiliary power. Since the Qinghai-Tibet Railway started operation two years ago, every train running on the line has been equipped with sewage and garbage collectors. There are garbage-collecting vehicles at Golmud and Lhasa to mass-treat the refuse and garbage collected from the trains. In addition, 15 wastewater treatment centers were set up along the Gela Section and are monitored every month to ensure that sewage is discharged according to required standards. The project of Qinghai-Tibet Railway won the State Special Award for Scientific and Technological Progress, sources from the National Science Awarding Conference for 2008 which was held in Beijing on January 9. The Golmud-Lhasa section of Qinghai-Tibet Railway stretches 1,142 kilometers and the highest altitude of the section reaches 5,072 meters. Three world-class difficulties including permafrost, alpine hypoxia and ecological fragility have been conquered, which is a miracle in the railway history. Plans are afoot to add six more rail lines to the Qinghai-Tibet railway to boost the region's economy, a railway spokesman said yesterday at the Beijing International Media Center. Included in the country's medium- and long-term railway network plan, the six lines are expected to be completed and put into operation before 2020, Wang Yongping, spokesman of the Ministry of Railways, said in Beijing. Detailed plans and cost of construction have yet to be finalized, he added. 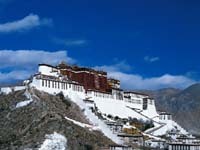 The six new tracks include one from Lhasa to Nyingchi and one from Lhasa to Xigaze, both in the Tibet autonomous region. Three tracks will originate from Golmud in Qinghai province and run to Chengdu in Sichuan province, Dunhuang in Gansu province, and Kuerle of the Xinjiang Uygur autonomous region. The sixth will link Xining, capital of Qinghai, with Zhangye in Gansu. Construction on the Golmud-Dunhuang section is likely to begin first. The official said experts have already been dispatched to the region to work on the route design. Work on the lines from Lhasa to Nyingchi and Xigaze is likely to begin before 2010, he said. Earlier reports suggested the Lhasa-Xigaze railway would be extended to link it with neighboring countries, but Wang said the ministry has no such plans as of now. The ministry is now working to enable trains to run at 200 kph on the Qinghai-Tibet railway's Xining-Golmud section in the near future, said Wang Zhongyu, deputy general manager of Qinghai-Tibet Railway Company, yesterday. Work to make the Golmud-Lhasa section - 550 km of which is built across a frozen swathe - any faster is unlikely. "At 100 kph, it is already very fast, compared with those in Canada and Russia, which were also built in icy areas but run at 60 to 80 kph," he said. "In two years of operation, our train service has not been suspended even once due to the ice," he added. In the wake of the May 12 earthquake, which also shook the Tangula Mountains region through which the track passes, the railway has upgraded its contingency plans. "In the event of an earthquake in the region, we will stop trains and send maintenance teams along the route to make sure everything is fine," he said. In two years, the 1,956-km railway has moved 5.56 million passengers and 4.05 million tons of cargo, lowering prices of daily necessities and other consumer goods. China on Tuesday (October 3) put a new passenger train into service to Lhasa from Guangzhou, capital of southern China's Guangdong Province. The train ride takes 57 hours and 21 minutes to cover the 4,980-kilometer distance, which might be the longest rail journey in this country. The express train left Guangzhou at 10:29 a.m. on Monday and is expected to arrive at Lhasa at 19:50 p.m. on Thursday. 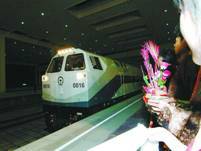 From October 5, there will be one express train from Lhasa to Guangzhou every other day. The train will leave Lhasa at 08:32 a.m. and arrives in Guangzhou at 07:37 p.m. the third day. China opened the 4,373-km Shanghai-Lhasa passenger train service on Sunday (October 1), arriving at 19:50 p.m. on Oct. 3. By Friday, the 1,956-km Qinghai-Tibet Railway, the world's highest railway, carried 380,500 passengers to Lhasa since entering service on July 1, said Sun Yongfu, director of construction for the plateau railway. The first train coded as "Qing 1"gradually left the station at 11:05 am on Saturday and took its maiden trip across the Qinghai-Tibet Plateau. It finally arrived at Lhasa's brand-new Train Station at 00:31 on July 2, proclaiming the end of no train whistling on the roof of the world. - A professional tour operator offering private & group China tours, Yangtze Cruises, China hotel & ticket booking services. - One stop China travel service specializing in China tours and discount Yangtze cruises. - A comprehensive web source for China travel and tour map users. - China Travel Listing is designed to be your one-stop solution for full access to all China-related travel information. 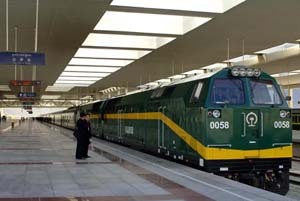 - ChinaTrainTrip.com specializes in train tours and train travel in China. A Guilin-based tour operator providing all comprehensive travel services in Guilin, Yangshuo and nearby areas. A reliable China-based tour operator, offering tailor-made tour packages to the rural areas of China.